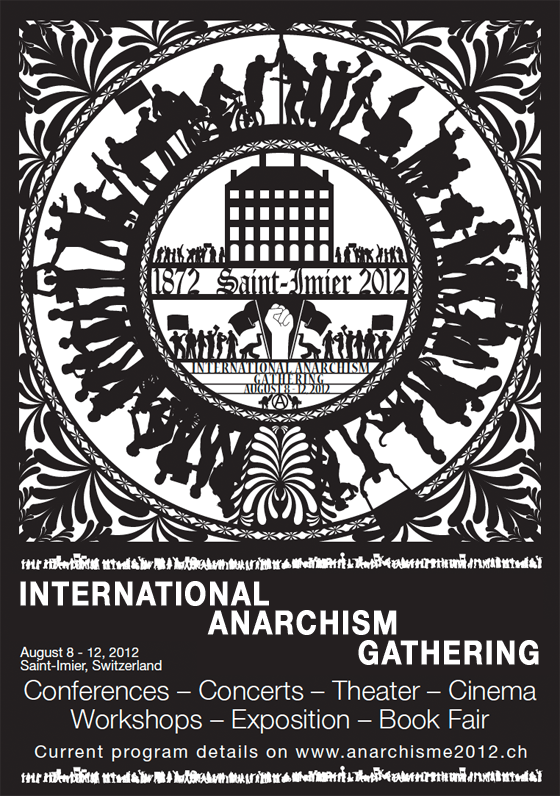 All libertarians from the various anarchist movements around the world, and all those interested in learning more about anarchism are invited to gather from August 8-12, 2012 in St-Imier in the Jura mountains in Switzerland. We will be celebrating the 140th anniversary of the first congress of St-Imier that was held in 1872, when the St-Imier Anarchist International was created after anti-authoritarian members were expelled from the First International. In 1864, the International Workers Association was founded, quickly followed by sections in La Chaux-de-Fonds, Le Locle, St-Imier and other regions in the Swiss Jura mountains. Many of the members in these sections were working in their homes as watchmakers, were well read, and had an independent spirit. When Bakunin came to the region in 1869, there was an immediate meeting of minds. 140 years after the Congress of St-Imier, the Marxist illusion has dissipated in light of the communist dictatorships. Capitalism lives from crisis to crisis. Social crises, political crises, in addition to the ecological crisis. The anarchist gathering in St-Imier in 2012 will be an opportunity to review the history of the anarchist movement, its ideas, its achievements, its hopes, its defeats, and its opportunities today; its own battles and those it shares with others: anti-militarism, anti-racism, anti-sexism, autonomous self-management, degrowth, education, feminism, internationalism, non-violence, etc.. A number of workshops and events are already planned: historical lectures, thematic conferences, theater, concerts, exhibitions, films, a book fair, a radio station, a libertarian camp, a self-managed market with organic products, workshops, restaurants, etc.. This international event will be public and wants to be open not only to the entire international anarchist movement, but also to the public at large without discrimination. Free admissions and voluntary pricing will be used wherever feasible, in order to enable as many people as possible to participate in the event. Having said that, the organizing committee will use its discretion to decide which participants will be hosted, based on the ideas and practices that were also the principals of the Anti-authoritarian International. Racism, sexism, xenophobia, homophobia and all forms of violence and discrimination will not be tolerated. Based on what has been said, any person, group, or organization is welcome to get involved and join this initiative, suggesting exhibitions, debates, lectures, performances, speakers, workshops, etc.. I will be offering a session on why and how current institutions will hand over responsibility to an empowered civil society. A presentation and workshop on concepts loosely based on the texts "The Foundation of Democracy" and "The Three Pillars of Democracy", but going further to explain and discuss how and why decentralization and deliberative democracy will work to replace hierarchy with higher forms of organisation, effectively eliminating the need for laws and shifting away from our culture of decision making to a culture of consensus development.